The school bus routes for the Thomaston schools are listed under the school that your student will be attending. You can find bus routes here. Parents should check the school district website for information about early dismissal days (for example: conferences and early release days). A list of Thomaston school hours can be found below. NOTE: Bus schedules are subject to revisions that result from enrollment changes, transfers and address changes. Changes and/or additions will be posted to the school district’s website and residents are encouraged to frequently check the Thomaston Public Schools website. Please do not worry if a bus is late, especially at the start of a school year when it typically takes a few days for kindergarten children and new students to become accustomed to the bus routes and schedules. If, however, you have concerns about your bus being consistently late over a period of several days, please contact All-Star Transportation’s Thomaston office at 860-283-0922. Thomaston High School – 7:25 a.m. – 2:16 p.m.
Thomaston Center School – 8:05 a.m. – 3:00 p.m.
Black Rock School – 8:15 a.m. – 3:10 p.m. Morning Session – 8:20 a.m. – 11:00 a.m. Afternoon Session – 12:15 p.m. – 2:55 p.m.
Thomaston High School – 9:25 a.m.
Thomaston Center School – 10:05 a.m.
Black Rock School – 10:15 a.m. Afternoon Session – 12:15 p.m.
Thomaston High School – 11:51 a.m.
Thomaston Center School – 12:30 p.m.
Black Rock School – 12:40 p.m. Morning Session – 11:00 a.m.
Bristol Technical Education Center – 11:30 a.m.
W.F. Kaynor Technical High School – 11:30 a.m.
Maloney Magnet Elementary School – 11:30 a.m.
Oliver Wolcott Technical High School – 11:30 a.m.
Rotella Interdistrict Magnet School – 12:00 p.m.
Wamogo High School – 11:30 a.m.
Waterbury Arts Magnet School – 11:05 a.m.
– On days when Thomaston Public Schools are closed due to inclement weather, out-of-district buses will not run, even if the out-of-district schools remain open. – On those days when Thomaston schools are closed early due to weather, buses for out-of-district students will be transported on an early-dismissal schedule, even if their schools remain on their regular schedules. – On days when Thomaston schools have a delayed, two-hour opening, out-of-district buses also will be delayed two hours. You can find complete details on the Thomaston Public Schools website. 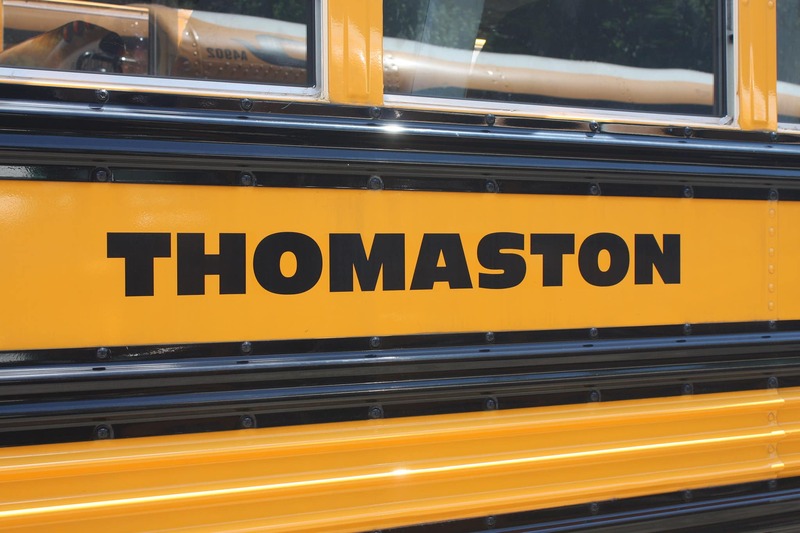 All students traveling to out-of-district schools meet their buses at the Thomaston Public Schools Bus Hub located in the rear parking area of Thomaston High School. At that location there is a shelter for out-of-district students near the gray storage containers. You can find complete details about out-of-district buses routes and schedules on the Thomaston Public Schools website. You can find complete details about out-of-district buses routes and schedules on the Thomaston Public Schools website. All out-of-district students must be dropped off at the bus shelter in the rear parking area of Thomaston High School at least five minutes before their scheduled bus pick up time. Parents, guardians and carpool drivers are asked to pull up near the bus shelter to drop off students for bus pickup; do not follow behind the bus or block the bus pickup lane. Parents, guardians and carpool drivers who wish to wait until students are picked up must park in the spaces numbered 60-80. Students of waiting drivers are expected to wait in the bus shelter; students will not approach a bus from a parked vehicle. For the safety of our out-of-district students, parents, guardians and carpool drivers must maintain a 25-foot safety zone around school buses. Using the shelter and parking in designated spaces will enable parents, guardians and carpool drivers to maintain this safety zone with limited effort and concern. All out-of-district students must be picked up at the Bus Hub in the rear parking area of Thomaston High School. Parents, guardians and carpool drivers are not to pull up near the bus shelter to pick up students in the afternoon. Students must not approach a moving vehicle or a vehicle not parked in the designated parking area. All parents, guardians and carpool drivers must park their vehicles in one of the spaces numbered 60-80 approximately five (5) minutes prior to the bus drop-off time; do not follow behind the bus or block the bus drop-off lane. Students of waiting drivers are expected to walk, not run, to their parent’s, guardian’s or carpool driver’s vehicles with the exception of Rotella and Maloney students who are expected to meet their parents, guardians, or carpool drivers at the bus shelter. In the afternoon, students attending Bristol Tech, Kaynor, Oliver Wolcott, Wamogo and Waterbury Arts may be picked up at the Bus Hub or they may choose to transfer to a bus that will transport them to a bus stop near their home. If you have any questions, please contact All-Star Transportation’s Thomaston office at 860-283-0922 or email [email protected]. Any individual seeking a change to a student’s pick-up and / or drop-off procedure must complete a change request form and submit it to their student’s school principal. You can find the form here. All Pre-K and Kindergarten students will be dropped-off at their assigned bus stops and must be met by a parent or an authorized adult / caregiver, or they will be returned to his/her home school. If a student is uncomfortable when getting off at his or her bus stop, that student also will be returned to school. It is advisable for parents to provide a note to their student’s school if they want their student to be dropped off at their bus stop without an adult being present. In the event a change to a pick-up and drop-off schedule is needed during the school year, parents need to complete and submit a Transportation Change Request to their student’s school principal. The request form can be found online by clicking here.